This is not about MAKING custom menus in WordPress. I’m just showing you how to “activate or deactivate” the three main menu types in StudioPress themes. If your theme has sidebar or footer widget areas you can add custom menus there too. First we need to understand that the primary and secondary menus display in different places in different themes. The best way to see what the menus look like in your theme is to activate both primary and secondary menus and see where they display and how they behave. If you haven’t chosen a theme yet look at the StudioPress demo for your selected theme and see if you can see menus in different positions. 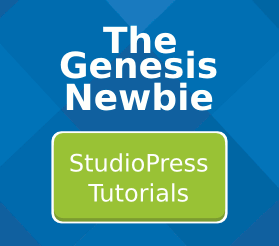 However, not all StudioPress themes have both primary and secondary menus. And some themes do have both menus but don’t use them in the StudioPress demo sites. Now in the Header Right widget area open the Custom Menu widget and choose a previously made menu from the list.